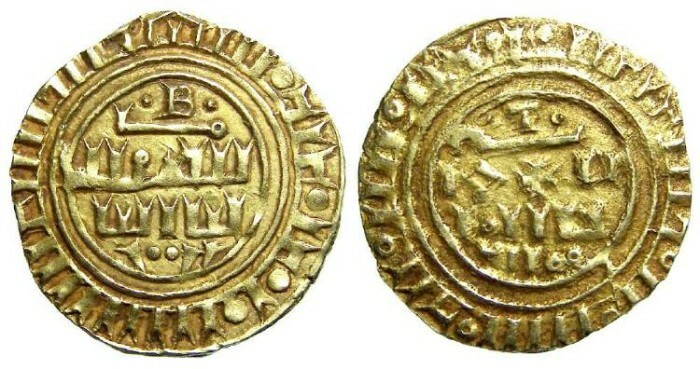 Crusaders gold Dinar, imitating Islamic gold. Third phase, after AD 1189. Denomination : Gold Dinar. The gold is slightly pale suggesting is had been debased with silver. Mint : The exact location of minting of this series is uncertain, but the T on the reverse may be a mint mark for Tripoli in Syria. Date : This coin is from the 3rd phase in this series, though to have been struck between about AD 1187 and 1260. The B on the obverse may stand for Bohemond, but this could be any of the Bohemonds from the IV to the VII. Reference : Coinage in the Crusader States -page 125, #8. Size : 22.0 x 22.9 mm. Weight : 3.39 grams. Grade : VF but the reverse was struck with a rusty die. Obverse : Pseudo Arabic inscriptions with a Latin letter B inside the top of the inner circle. Reverse : Pseudo Arabic inscriptions with a Latin letter T inside the top of the inner circle. The inscriptions appear to be derived from a al-Mustansir prototype.